The proposal, passed by state lawmakers in March, is set to begin in 2021 and aims to raise $1bn (£765m) annually. How the policy will be enforced remains to be seen, but experts forecast the fee to be around $11 (£8.50) per car. London, Singapore and Stockholm also have congestion fees and other American cities are considering such tolls. How will the toll work? No enforcement policy has been crafted yet, but the fee is expected to be enforced by a network of cameras around the city and sensors placed on registered vehicles. Cars that do not have the sensor - which would be similar to the interstate motorway toll system called the E-Z Pass - will have a photo taken of their car's number plate and a bill will be sent to them in the post. 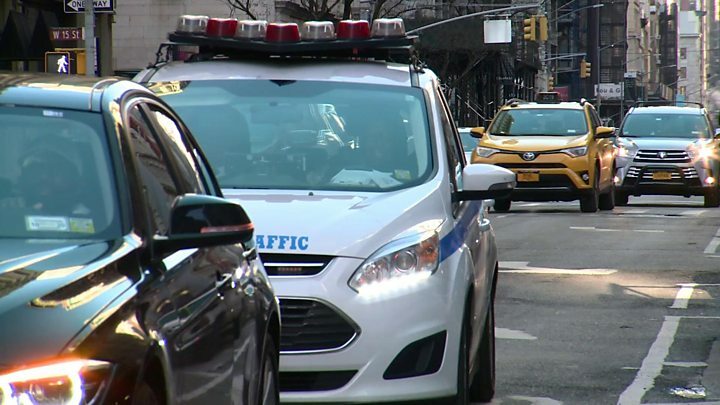 The charge would apply to cars travelling below 60th Street in Manhattan's central business district but exceptions may be carved out for residents who live within that perimeter. Media captionWhat do New Yorkers have to say about the congestion charge? In London, which introduced a similar fee in 2003, residents inside the congestion district are entitled to a 90% discount. Some New York City politicians have called for a total exemption on driving fees for locals. Cars on the motorways that border the east and west edges of the island are not expected to be charged as they pass through the congestion zone. As in other cities, the fee is not expected to apply to bicycles, motorbikes or mopeds. Urban transportation policy consultant Bruce Schaller says the "major emphasis" of this proposal is to raise money for the Metropolitan Transport Authority (MTA), which runs services such as the subway and bus system. "What we worked on a decade ago, it was pretty much equal emphasis on reducing traffic congestion," says Mr Schaller, explaining that the proposal has been in the works for many years. "But congestion is also an important part of the picture here." Todd Litman, a transportation policy analyst at the Victoria Transport Policy Institute in Canada, says that for the plan to be considered a success, the congestion rate must fall around 20%. Charging a moderate fee can get you a 10% to 20% reduction, says Mr Litman, but a steeper fee would probably have the effect of getting even more cars off the road. He predicts that unlike London, which charges a flat £11.50 day fee for cars in the eight-square mile zone, New York will enact a variable system with prices rising and falling during peak and off-peak hours. He says the New York variable plan will function like a utility bill - in which users are billed based on how much they use - a system that he said would be less wasteful than a day fee. Variable fees "encourage you to use that resource more efficiently," says Mr Litman, "and we fail to do that with roads". Much will depend on public transportation - which New York Governor Andrew Cuomo has describes as "failing" - as lower income residents who are most affected by the fee, will likely resort to other methods of travel besides private vehicle. One factor driving the implementation of a congestion tax is the concern over air pollution. According to an NCBI pollution study, Londoners gained around 1,888 years of life due to the reduction of fine particulate in the air. Will some vehicles be exempt? The cost per commercial truck - an industry also lobbying for an exemption - is forecast to be around $25. Vans and buses that hold several passengers will likely be given priority. "A bus passenger is giving up a tenth as much road space as somebody driving alone in their car," says Mr Litman. "Everybody benefits if you give priority to the higher value trips." Exceptions are expected to be made for people with medical disabilities, and could be extended to police patrol cars. The famous yellow cabs had lobbied for an exemption but instead got a discount - they will pay $2.50. Rideshare drivers like Uber and Lyft will pay $2.75. Has the London congestion charge worked? Opponents in New York say the charge will push drivers into neighbourhoods that already have high rates of asthma and air pollution such as Harlem, south Bronx and Bedford-Stuyvesant. For this reason, says New York City Councilman Daneek Miller, it will be very regressive, putting the burden on those living outside Manhattan. "It is the outer borough people that go into Manhattan that would be paying the price." There were similar fears in London but Tony Travers, a professor at the London School of Economics, says that testing done five years after implementation in London shows this had not happened. London's system remains divisive, as the standard fee has more than doubled since its 2003 introduction. A recent YouGov poll found that 72% of Londoners support even steeper fees for drivers of older or dirtier cars - a plan known as the ultra low emission zone (ULEZ) which has recently been implemented by Mayor Sadiq Khan. New Yorkers themselves are not thrilled about the congestion charge, with a Quinnipiac University poll in early April finding that 54% of city residents opposed it as well as 48% of suburbanites. Many opponents of the charge in New York are simply against paying for something that they previously felt like they got for free, says Mr Litman, who adds that the US government spends around $500 to $1,000 on roads for each privately owned American vehicle. Half of road costs are paid for by drivers through fuel prices and vehicle registrations but half is paid through general property and sales taxes that people are required to pay regardless of whether they drive. "Under congested urban conditions, motorists are going to pay for congestion, either in time or in money. You either pay directly or indirectly for those roads." Has it worked in London? The London toll has reduced the amount of cars on the road in central London by around 30% since the charges were implemented, says Mr Travers, and has led to an improvement in average traffic speeds. Although the total number of vehicles on the street has lowered, the total street space has also reduced, he says. Other benefits - such as wider passenger sidewalks and pavements and increasing the crossing times for pedestrians at junctions - have also been funded using the $300-400m generated each year from congestion charges. Despite the lower number of vehicles on the roads, the roads may seem just as congested as before since they have been shrunken to make room for extra pedestrians. The result has been the same overall level of congestion, he says. 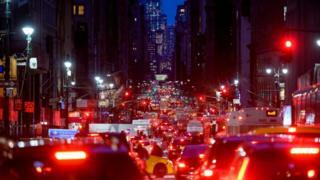 Video What do New Yorkers have to say about the congestion charge?